← Koons Biggest Loser Challenge 2014 is under way! Cold Weather and Tire Pressure, or, Why Does That GOSH DARN Sensor Keep Going Off?! Do you remember how back in the early ‘80s when VCRs were all the rage? Everyone had one and we all had the same issue, “How do you set the clock so it stops blinking at you?” A comedian solved the issue, in his monologue he asked that question and then produced a piece of black electrical tape, which he placed over the blinking LEDs, and, viola, problem solved. Well we’re not advocating that you should do that with the pressure sensor, but boy it sure would feel good to just make it go away…right? In addition to safe driving, tire pressuer plays a large role in wear, under inflated tires wear on the edges and overinflated wear on the center, correclty inflated tires coupled with rotating them will increase the longevity of the tire. Most of the major car manufacturers offer tire pressure warning systems on new cars and you can even expect to find them on some older models back about 2 years now. It is a wireless system that sits inside the tire and senses when the pressure has dropped +/- 3 to 5 lbs. per tire to alert you. It’s pretty simple stuff and it’s also pretty bullet proof, except for one thing, the gas you use to fill up your tires with. Most people use air form a household or gas station pump to fill their tires, the problem with the air from those pumps is that it is subject to pressure fluctuations. So when the weather gets cold or hot the pressure inside the tires can swing 2-8 lbs. This affects the sensors and the alert is set off. Using nitrogen as the gas of choice in your tires can solve this. Thank you Indy Car racers for teaching us about this little trick! Basic high school science teaches that nitrogen (N) molecules are bigger than oxygen (O) molecules so they can’t leak out as easily and therefor tires filled with this gas don’t fluctuate. As a rule, whenever you bring your car in for service at any Koons Automotive center we check and fill all of the tires for free. 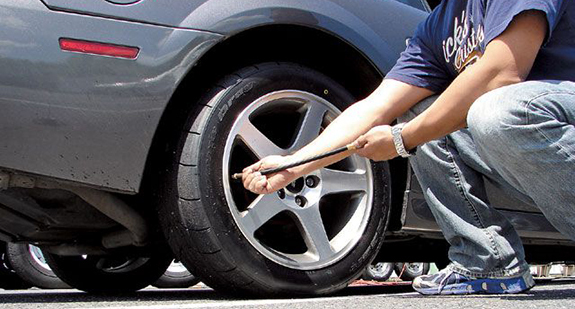 If you have a pressure sensing system in your tires we check and fill them with nitrogen, also for free. That way if you have a sensing system you can drive safe in the knowledge that your tires are working at their optimum. If you don’t you still need to check them and top them off as needed. So put the tape away and the next time you’re in for service ask for more info on switching over to nitrogen, there is an initial set-up fee after which the fill-ups are free! Posted on January 13, 2014, in Automotive, Maintenance Monday and tagged Jim Koons, Koons, Koons Automotive, Maintenance Monday. Bookmark the permalink. Leave a comment.